Whilst my blog mainly focuses around beauty I think it's nice to mix it up, so I thought it would be nice to share my latest clothing purchases. I've been buying quite a few bits but my wardrobe has needed it! I made an online order from H&M just before I went on holiday and then I received an email on Thursday to say they where having a huge sale and then ended up buying a load more, I will blog about the sale items separately. Oh and I have a Primark haul to share! When the Summer H&M catalogue landed on my doorstep, I started circling everything I wanted, please tell me I'm not the only one who does this? I ended up having a look online and then found myself ordering a few new pieces from their Summer Collection. 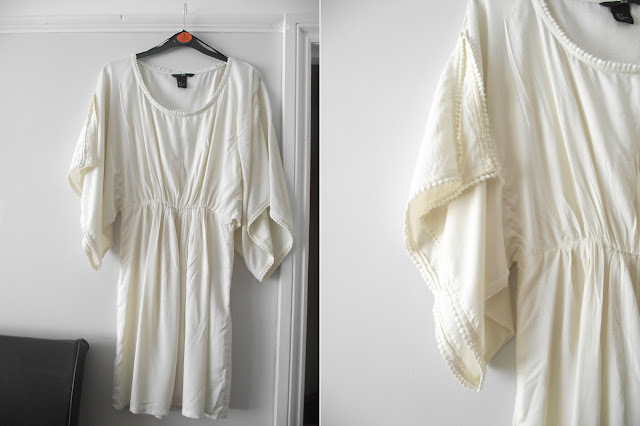 The first item which I fell in love with was this beautiful short cream dress with kimono sleeves and elasticated waist. The collar and sleeves have a pretty edging to them which looks so sweet and feminine. This dress was £12.99 but is now sold out online which is not a surprise, but I would check instore. I don't have many summer dresses, so thought I would invest in another one which is really easy to wear but still very pretty and perfect for summer. I loved the colour and crochet detailing across the top and back of the dress. The jersey material is nice and cool to wear and the dress hangs lovely. There's a little tie with gold beads on the end which helps accentuate the waist. This was also £12.99 and again sold out online, BUT I saw this in my local store Thursday! Now I don't think these shoes will be very ones cup of tea and yes granny does come to mind, but they're rose gold metallic- end of! I bought these when they were £9.99 but they're now £4.99 online. 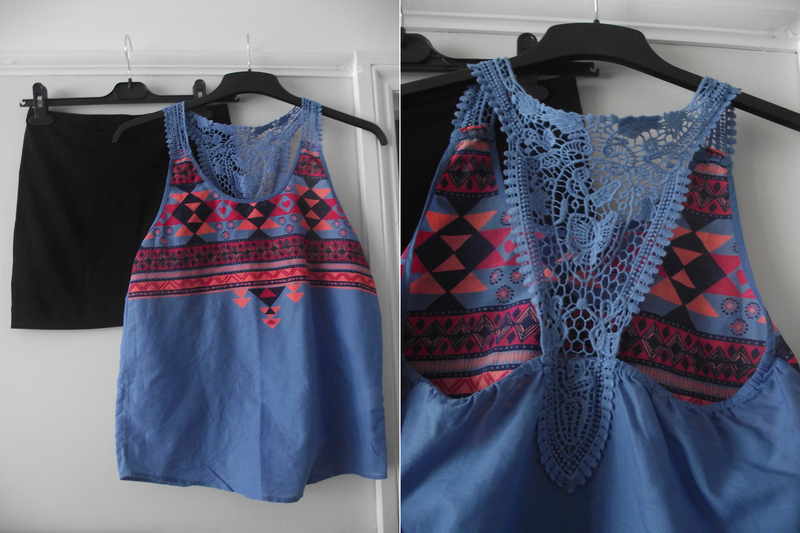 I have heaps of H&M vest tops, I love how easy you can wear them, either with jeans or denim shorts. But this time I decided to invest in a couple body con skirts. I bought one black and one turquoise. I just love how easy they are to wear and also comfy! I love cats, as some of you may know I have 2 furry friends (that sounds so wrong!) 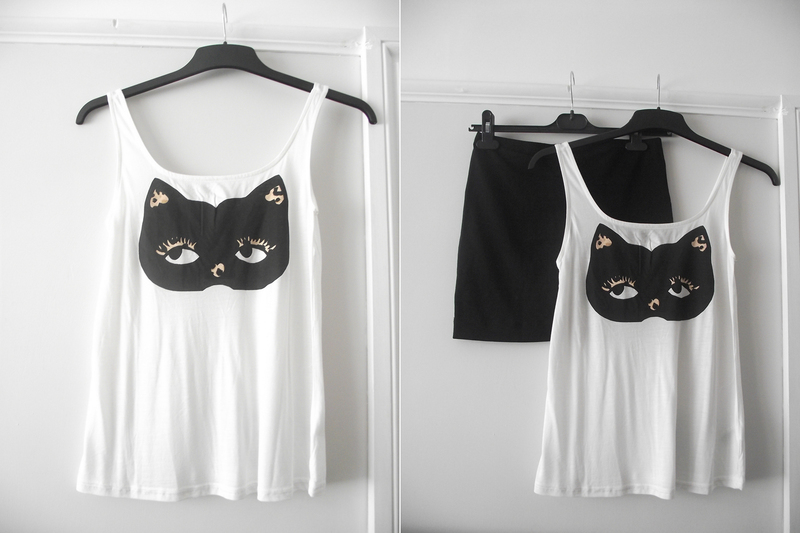 anyway so when I saw this cute printed cat vest I had to have it at £7.99! Then following the tribal/aztec trend I saw this really cool printed vest top which has the most beautiful crochet racer back to it. It's so gorgeous, these photos don't do it justice. I thought for £12.99 it was a steal! I would team this up with the black body con skirt, these are so cheap at £3.99. It's great if you can mix 'n' match your clothes. After deciding on the black body con skirt, I opted for another one after seeing this model wearing the turquoise one and then of course I had to order the pretty white vest top as well. I'm still waiting for the turquoise skirt to arrive. But you can see from the model how they look together. I didn't realise how loose fitting this vest top was until it arrived so I would've got away with a size 8 but the 10 will be fine and I will wear a vest top underneath. It has a pretty pattern which I hope you can see from the photos below, it is sheer but would be great over the top of your bikini. The vest top was £3.99 and the body con skirt was £2.99. I also bought some pieces for my children, the children's clothes are mega cheap, sometimes cheaper than primark. Plus I think they wash better than Primark. This little tunic dress was only £2.99, they have lots of other designs, these look great with little leggings underneath especially jeggings! I loved the Flamingo print, there's also a dress which I bought but that's in the ironing pile! This vest top was only £2.99 as well! My daughter is a Hello Kitty fan and adores Hello Kitty, my friends bought her these shorts, they even have cute little pockets! These where £5.99. Lastly I got this for my son, he loves skulls and thought this would be perfect for windy cold days! I can't remember how much this was, I think £9.99. So there you have it, my H&M haul #1. There will be another one coming once my sale items arrive, if you liked this post let me know and I will be sure to show you what I bought in the sale! What clothes have you bought recently? Ahh I have been loving H&M recently, they have lots of pretty things in! I love that first dress, it's a shame it is sold out already :( I bet it looks so flattering on! I bought the mint jeggings at hm today! I love your recent purchases!